I’m an island girl. A beach baby. All my favourite places on this planet are surrounded by beach, beautiful vistas and water, so it’s no wonder I love Fort Myers Beach. The white sand beach seems to be never-ending, the ambiance of Fort Myers Beach as a destination or community is unpretentious, and it’s quite accessible to other parts of Florida, being just three hours (less than 200 miles) southwest of central Florida and our previous destination of Orlando. 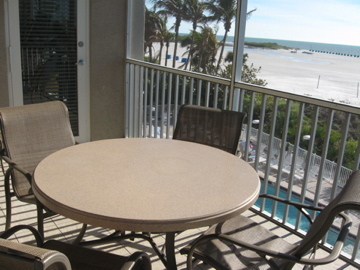 We were fabulously fortunate to be hosted by the GullWing Beach Resort, located on a wide stretch of Fort Myers Beach. The GullWing is part of the Sunstream family of properties and top-notch in every way. Our expansive suite was so large, we occasionally got lost in it! The spacious screened-in lanai overlooked the beach, and it was just a short walk before we were immersed in the welcoming waters of the Gulf of Mexico. We also enjoyed the pool and the poolside hot tub. There are no restaurants on-site as the GullWing is a condominium property. Each suite is owned by individual owners, so decor varies from unit to unit. I can tell you that Suite 306, decorated throughout in shades of green and blue, was most pleasing to this nature-loving water baby. Most of the “action” happens at the north end of Fort Myers Beach, just as you come off the Matanzas Pass Bridge (also known as the “Sky Bridge” because it seems to touch the sky) onto Estero Blvd, the road running from the north end of Fort Myers Beach to the less populated southern end. The GullWing is located more towards the southern end of the strip, but just a short drive to the rest of the action. And we liked it that way. Less traffic, fewer people and more birds. I do love the pier at the northern end of Fort Myers Beach. You see many kids and adults fishing, a few brown pelicans resting peacefully in the sun and a terrific view of the entire beach. And right at the foot of the pier, you’ll find Kilwin’s, who make terrific chocolate goodies. Try the dark chocolate “Sea Foam.” It reminded me of sponge toffee. Now, doesn’t that bring back some warm childhood memories? Kilwin’s is also famous for their fudge and ice cream. But I can only swear by the chocolate, and it was indeed, good. Yes, you’re right! I hadn’t come to Fort Myers Beach strictly for the beach. (You know me better than that!) I came for the chocolate, as it was the next research stop for Chocolatour. Please join me here the week of April 25th for more on a find that is perhaps the best chocolate that has ever passed these chocolate-loving lips. 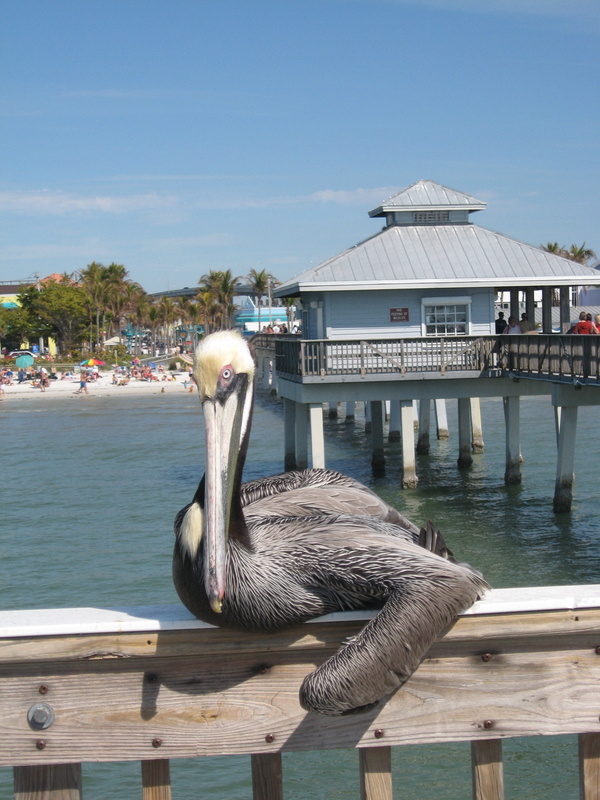 In the meantime, please share your thoughts about Fort Myers Beach, your favourite place in Florida, pelicans, sponge toffee, or anything else that makes you smile. fantastic images! it reminds me of my childhood visit to Portugal and the smell of the ocean! Thanks, Manny. Haven’t yet been to Portugal, but it is certainly on my list. So many people have had great things to say about it. Glad you’re enjoying our tasty travels here on the blog. Amazing photo of the pelican. All the pictures are beautiful and enticing. Warm weather where art thou? I can’t wait for summer too come here! Thanks, and I hear you, Suzanne! We, too, have been waiting far too long for spring. I spoke to my colleague in Fort Myers today and he told me it is sunny & 85 degrees F. I could very happily live there. Fort Myers is a beautiful area, thanks for sharing. It’s amazing how low real estate has gone in that area. It may be a great time to buy if you plan on being a snowbird. Thanks for your comment, Daryl, and for joining the blog. I would definitely be interested in buying a snowbird property in Fort Myers — if I hadn’t bought that timeshare property in Vegas a couple of years ago. That is a mistake I am still living with. I must say the Pelican knows its angles as if it was on a cycle of Bird’s Next Top Model. Hehe! It’s a great shot by the way. We’re just dropping by to wish you good luck on your quest to finding the best chocolate in the world. What you’re doing is awesome! Chocolates are awesome! Thanks, Shirl (and Naldo)! Yes, chocolate is awesome in every way. This has definitely been the tastiest project I’ve ever worked on and is undoubtedly my calling in life. Thanks for following along with us. And stay tuned for more great chocolate revelations!